June is the busiest time of year for our organization, the Chesapeake Bay Oyster Reef Recovery Initiative (ORRI). We pick up juvenile oysters from 365 growers and then cap off the growing season with a celebration and party for our growers and partners. 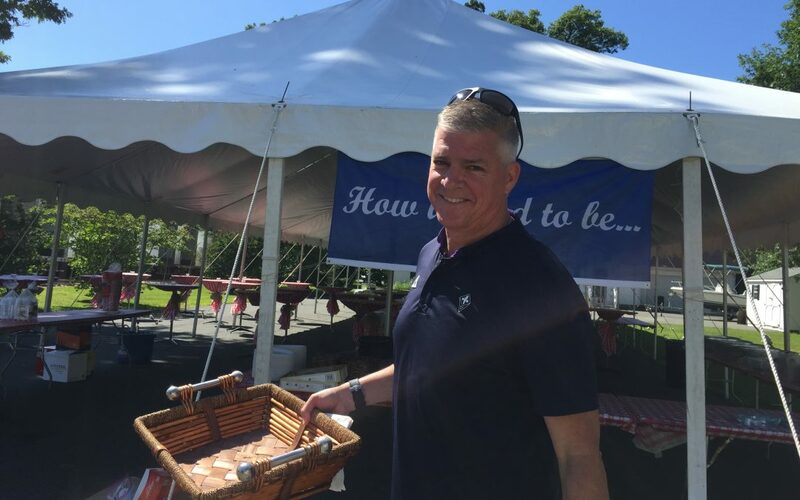 This year, oyster pickup was held on Friday, June 1. Luckily, it was the only day that week where rain was not in the forecast. People arrived at the office of our founding sponsor, Eglseder Wealth Management Group, Inc., around 8 a.m. to get their route assignments and fuel up on coffee and doughnuts. There were more than 500 buckets waiting to be filled with baby oysters, which translates to over 1,000 cages in the water. Volunteers were on their way by 9 a.m., and the first volunteer finished at Easton Point by 10 a.m. From there, the buckets started lining up quickly. Waterman Robert Crow arrived shortly thereafter and began filling his boat with the first load of juvenile oysters to take to our sanctuary. It was a hot, sunny day for pulling cages up from the docks. This year, there seemed to be a lot of fouling on the cages. Most of our volunteers commented on how difficult it is to pull heavily fouled cages out of the water, some of them were so heavy it took two people to pull them up. By 4 p.m., all the oysters had been planted in the sanctuary. Usually, this process can take up to two days. However, we have amazing volunteers and were so grateful to Crow for his help — all worked incredibly hard and really fast this year to get it all finished in under eight hours. While no endeavor is perfect and there can be pieces that don’t come together seamlessly, we do try to improve with every delivery and pick up. 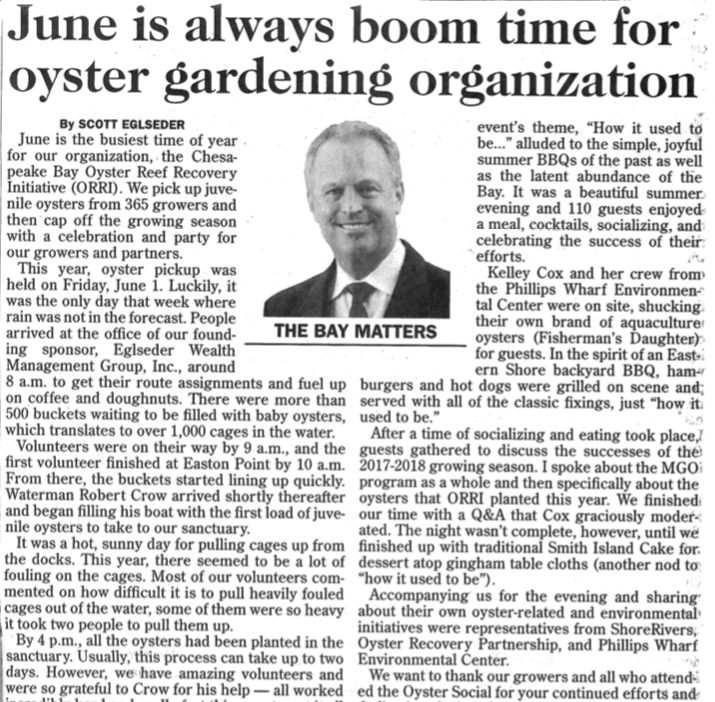 Then, on June 14, the seventh annual Oyster Social was also held at EWMG’s office location. The event’s theme, “How it used to be…” alluded to the simple, joyful summer BBQs of the past as well as the latent abundance of the Bay. It was a beautiful summer evening and 110 guests enjoyed a meal, cocktails, socializing, and celebrating the success of their efforts. After a time of socializing and eating took place, guests gathered to discuss the successes of the 2017-2018 growing season. I spoke about the MGO program as a whole and then specifically about the oysters that ORRI planted this year. We finished our time with a Q&A that Cox graciously moderated. The night wasn’t complete, however, until we finished up with traditional Smith Island Cake for dessert atop gingham table cloths (another nod to “how it used to be”). Accompanying us for the evening and sharing about their own oyster-related and environmental initiatives were representatives from ShoreRivers, Oyster Recovery Partnership, and Phillips Wharf Environmental Center. We want to thank our growers and all who attended the Oyster Social for your continued efforts and dedication during the 2017-2018 growing season. ORRI would not exist without your faithful partnership and we commend you for making a difference in the effort to restore Bay health through oyster gardening.